There are a few different situations here. First, you have hunters who have a dog that will not hunt, or for whatever reason can't hunt, and they surrender their dogs to an animal shelter or rescue. In fact, some shelters and rescues say they would rather the dogs are surrendered then simply abandoned or killed. But many rural shelters can't always handle the influx of dogs. Which means dogs get euthanized. With apologies to JRR Tolkein, not all hounds that wander are lost. In other words, there may be hounds still on the hunt that people unintentionally pick up and take to a shelter, thinking it's lost. Or worse, according to some hunters -- STEAL hunting dogs and take them to shelters. Yes, that's right -- check out that Hunters for Hounds page again. Read the comments sections where hunters accuse animal rescuers of actually stealing dogs. "It really doesn't matter how they got to the pound what matters is their future. Our rescue by no means meant to imply that all hunters treat their dogs bad or abandon them when they will not hunt because that simply wouldn't be the truth. As with any group of people there is good and bad." Again, the problem is hunting dogs can travel long distances. 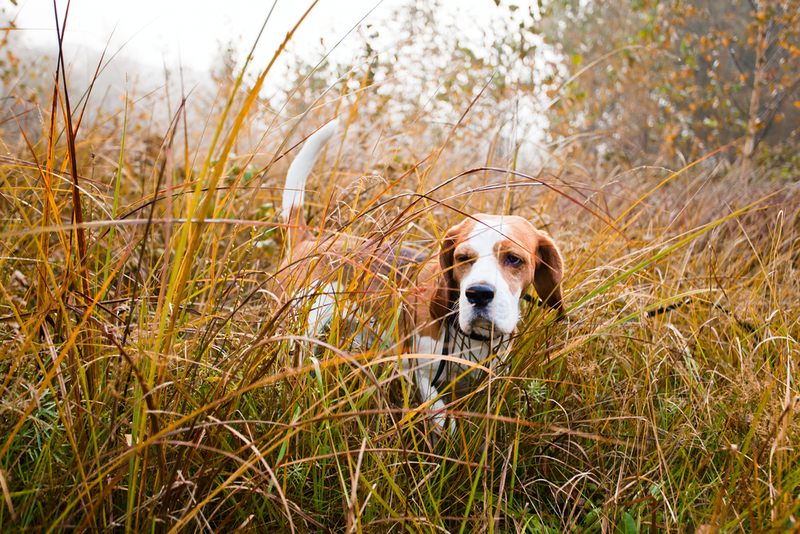 This is why hunters who are doing it right usually equip their dogs with tracking collars, microchipping, and other forms of identification. This way they can find a wayward pup. 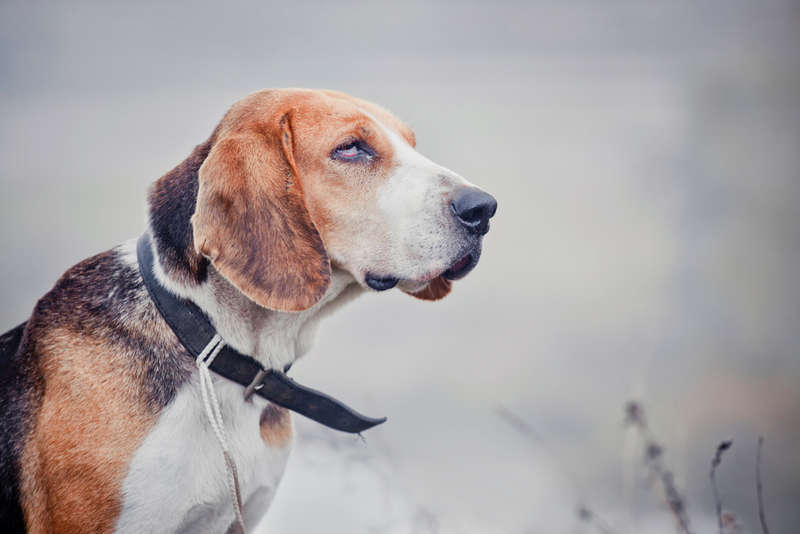 Hunters will make sure their dog is wearing a collar with contact info, maybe even a tracker. But some hunters have reported finding their tracking collars cut off a dog and left behind, and their dog in a shelter. Again, is this true for all dogs and hunters? Probably not. "Honestly, too many 'finders' don't bother to look for an owner, and just assume the dog is unwanted," said the owner of the Hunting for Hounds Facebook page. "We need better education in that area. On the other side, many hunters seem to think every rescue goes around stealing dogs, which is so far from the truth." River was found near Sand Lake Wildlife Refuge in Massachusetts earlier this month when, according to the Watertown Public Opinion, she retrieved another hunter's pheasant. River, an 8 to 10-year-old yellow labrador, was thin, with sores on her paws and joints. It's estimated she survived several days in subzero temperatures. River had no microchip (seriously folks, microchip your dogs!). She had no tags or any other identifiers. Just a collar. She was clearly well-trained, but not fixed. The shelter workers suspect she got lost and the owner didn't do enough to look for her. River was adopted a few weeks later. Shelters can only do so much to find a missing dog's owner. And not every person who picks up a dog seen near a road or out by itself is trying to steal the dog. They may be thinking they are helping a lost pet. They simply don't know any better, and they certainly don't deserve a hunter's ire. If you are very much anti-hunting and you are not interested in respecting hunting traditions, then the next part of the post simply isn't for you. Because I'm going to explain what people should look for when they find a dog to tell if it's a hunting dog -- or a discarded dog. 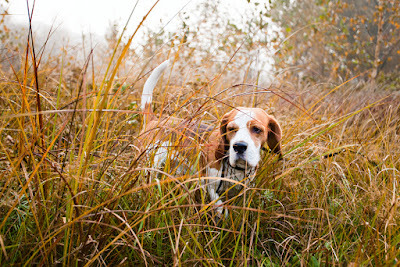 No matter what kind of hunting dog, never assume the dog is lost or abandoned just yet. So you're driving down a road or you're in a wooded area and you come across a dog. Is it a hunting dog currently on a hunt? Is it a hunting dog that's been dumped? Does it need your help, or should you leave it alone? It's a tough call for anyone who loves dogs. 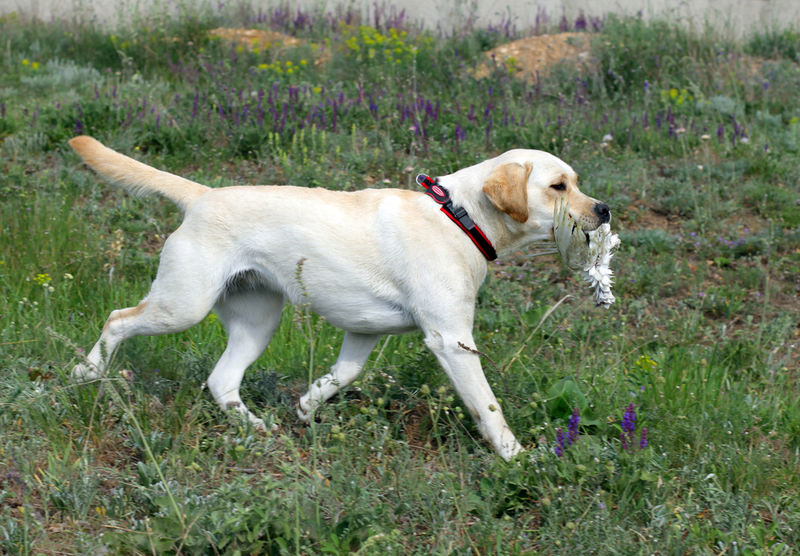 But here are some quick ways to tell, from people who work with, and rescue, hunting dogs. 1. Does the collar have a tracker? These days many hunters use trackers on their dogs. If you find one and it has a tracker, it's best to leave it alone, unless it is in a dangerous situation. Then try to turn the toward a safer direction. 2. Look at the collar. Is it in good condition? Are there tags with contact info? The Florida rescue group The London Sanctuary, says hunting dogs that are well cared for will have good collars with either tags or engraved plates with contact info on it. DO NOT REMOVE THE COLLAR, TAGS OR TRACKER. 3. Don't assume a dirty dog is an abandoned dog. Hunting is a dirty job. 4. Don't assume a thin dog is a dog that's abandoned or neglected. A hunting dog might be a bit on the lean side. They are pretty active, so they're not going to be like a couch potato dog. They are working dogs. 5. If the dog is in a dangerous place, don't just pick it up. If there is contact info on the collar, try to contact the person before you leave the area. Don't leave with the dog until you know for sure if you can get hold of the owner. 6. If you can't get a hold of the owner, try to find a local place to take the dog first. Try a vet, or a rescue or shelter. Don't take the dog far from the area if you can help it. If you are in a wooded area, perhaps find a ranger station or a hunting camp. They may know whose dog it is. 8. The dog is clearly hurt. Then find a place to get the dog help. Where ever that may be. 9. If the collar is ratty, there's no contact info, or worse -- no collar. True, it could have lost its collar, but if there's not collar, or you find contact info but the owner acts like the dog is not theirs or seems to only want the collar back, then you know the dog was dumped. 10. If the dog is clearly not just on the lean side, but emaciated. On a regular hunting dog, you might be able to see some ribs, but you shouldn't be able to see all the ribs. The dog should not seem so thin that they are obviously starving. 11. Look for wounds. Some dogs may have sores. Their paws may be ragged from being outside so long. They may have wounds elsewhere. Some dogs may even have been shot. It's a shame, but it does happen. And if you are interested in adopting a hunting hound, I have a list of rescues that care for beagles and other hunting hounds in a story I did back in 2015. 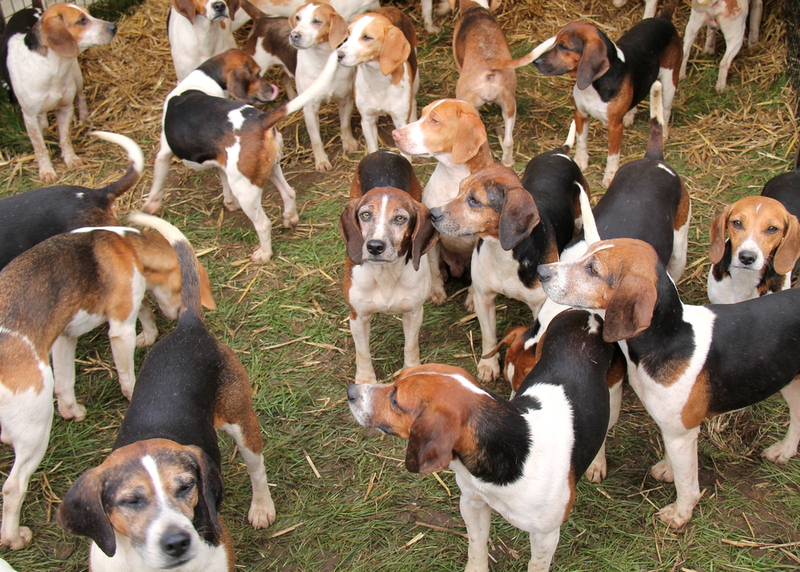 Do you own a hunting hound? Tell us your story in the comments section below. Had this happen Jan 2nd . Very sick beagle showed up with puncture wound and bad swelling , ticks , and bad earmites . Skinny and had fever . It was dangerous cold weather the whole week . Should not have been hunting and no collar . Took him to vet and doing great now. Did look for owner , no micro chip no luck . But now I think it's a blessing not to find owner . Oh wow. That's horrible! Glad he came to the right house! When I was a kid, my cousins in KY had beagles--lovely dogs--and routinely lost them during hunting season. In those days, no tracking collars or microchips to be had. This is an important discussion! Thank you! Whether people like it or not, hunting with dogs is a time-honored tradition in much of the country. But since a lot of people are not hunters, they may just be well-meaning dog lovers, they won't know not to pick up a dog they find and think needs help. And THEN they get accused of stealing! Just want to make people aware. I'm so glad that you wrote this post! I know nothing about hunting, but I think a lot of people assume a dog running loose has been abandoned. I hope this will help a lot of people discern a lost or abandoned dog from a dog who is doing his job. I didn't realize that hunting dogs got so far away from the hunter. This is a great post to bring awareness to this issue. I am not a dog person, as you know, but this is a tremendously important article so well done. It is a complex topic isn't it? Hunting dog may stray far but have they been dumped? I am not a hunting person I find it totally outside my comfort zone but it happens and dogs need to be taken care of. Here in NZ a dog has to be licensed and the owner is obliged to lace the numbered license disc on its collar. I just wish every dog on the planet was microchipped! We tend to stay away from hunting zones so I have yet to come across this problem. I do know that some framers have this issue as well. When they allow hikers access to their land - and suddenly the farm dog is being brought to the SPCA. I had no idea hunting dogs got SO far away from their care takers. I can see why this is a very hot debate between all involved. But I can't see how a responsible dog owner wouldn't have their dog microchipped. My only hope is that all turns out well for the dogs involved in these situations. Wow I had no idea such an issue like this was happening to hunters dogs. Not a fan of hunting however can empathize with them losing their dogs or their companions getting stolen. Although there is no guarantees, you laid out great tips here. This is really interesting...I didn't know about it at all. I'm part hound and I definitely wouldn't like it if someone took me just because I was wondering around. Personally I think whether you are pro hunting or against it - as an animal lover and advocate we all NEED to know this info! I thank you for posting it! No one should lose their dogs if they are well cared for and loved! I know some hunters who absolutely LOVE and ADORE their hunting dogs as pets. I know some who do not. Just like I know some regular pet parents who adore their pets and other pet "owners" who do not! Now I DO think if you ever let your dog off leash for a sport it should be REQUIRED to microchip them! Tracking collars are fantastic. We got one for Cookie, even we don't hunt per se, she does. I loved always knowing where she was and what she was doing. Such an important issue - and one that I hadn't thought about until reading this! It is always important to check for identification and/or microchips when you find a dog. My first instinct would always be to contact the owner listed on the tags and take the dog in until I could reunite it with it's family. However, after reading this, perhaps that isn't always the best idea since the dog could be out on a hunting trip! Thanks for the tips and signs to look out for! Since we live in the South, we have a lot of hunting! Personal opinions aside, I know most hunters love and take care of their dogs. However, I admit to being shocked when I heard a friend talking about dumping a dog if it wouldn't hunt. I couldn't believe it! I do believe people should have up-to-date collars with information and microchips if they are going to have dogs off leash for hunting. This is such an important topic. I didn't realize that this was such an issue. You gave great tips! I hope this post helps and reaches many so more know about this. I've run into hunting dogs while on canoe camping trips, especially in the Ozarks. Usually the dog has a collar and wanders away after a short time. Since we were canoeing and had no cell phone service there wasn't much we could do and we assumed it was hunting. Later we heard many beagles nearby, so clearly part of a pack that was hunting. We have 4... well 3 working hounds and a retired hound. All are micro chipped, collars are labelled and they have tracking collars on. We still have had dogs get lost for days (4 days was the longest). I agree with most of this article but I think that more could be done to educate the public's persona of the hunter and their hunting companions. By the way all of our hounds come in a night to sleep and are kept in when its too cold out.